In-house volunteers fill a valuable role in Legal Aid Society’s Pro Bono Program, supporting the work of LAS attorneys and expanding LAS’s capacity to serve clients in need. Dan Engel and Roxy Freel are outstanding examples of the dedication and high-quality work our in-house volunteers provide every day. Dan Engel first joined LAS in 2016 after a successful career in the private sector. He worked for Peterson & Ross as a trial attorney until 1997, and then became Senior Associate General Counsel at Blue Cross Blue Shield Association. After hearing Catherine Longkumer, Managing Attorney of LAS’s Individual Rights and Social Justice Practice Group, speak at an event, Dan was inspired to volunteer at LAS following his retirement. He now assists Catherine and represents his own clients in various immigration matters, drafting applications for U-visas and T-visas and providing immigration assistance for victims of domestic violence. Dan says the best part about volunteering at LAS is, “the satisfaction of knowing you’re helping people in need. They’re good people in difficult circumstances.” Dan also enjoys the intellectual challenge and the ability to practice his Spanish. He recently had a great victory when a client received her green card under the Violence Against Women Act. In his spare time, Dan volunteers at a Recyclery, builds and repairs bicycles for schools in low-income areas and homeless shelters, and sits on the board of Access to Care, a nonprofit health care program for low-income or uninsured residents of suburban Cook County. He is an ongoing volunteer at the federal detention centers in Texas, preparing for his fourth trip to San Antonio to assist Spanish-speaking immigrants with initial interviews for the asylum process. Dan is also an avid bicyclist, a theatre enthusiast, and father of three. Roxy Freel began volunteering with Legal Aid Society in 2017. Before joining LAS, she enjoyed her first job as a litigation consultant and then had a successful career in the business sector, working in finance, accounting, and consulting. She also served as a Court Appointed Special Advocate for 15 years and volunteered at LAF. As a volunteer paralegal, Roxy works closely with the Individual Rights and Social Justice Practice Group. She assists in every facet of the work, including drafting visa applications, filing, and researching tough legal questions. “I really love it here,” Roxy says. “I’m so impressed with how dedicated everyone is. Everyone is motivated to be here because they want to make a difference.” In fact, Roxy has been so inspired by volunteering at LAS that she is now considering attending law school and becoming a public interest attorney. She plans to take the LSAT this fall. In her time outside of LAS, Roxy enjoys skiing, yoga, paddle tennis, and being the mother of three boys. 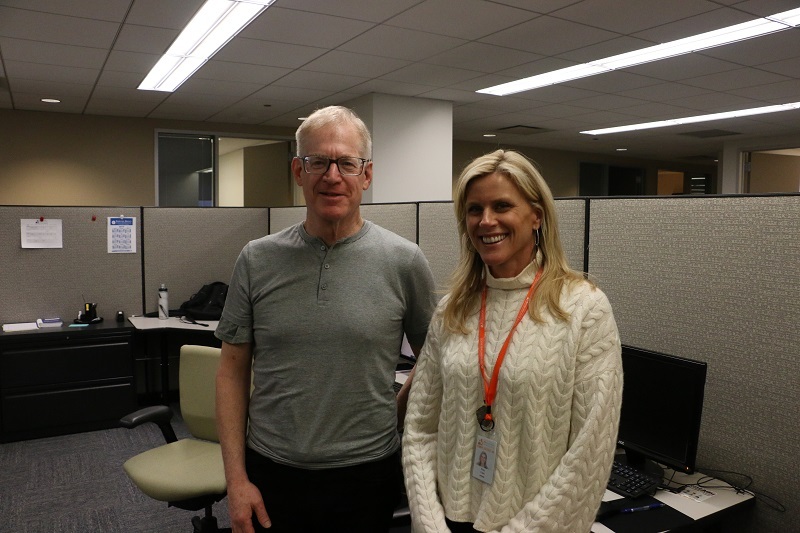 Dan and Roxy have been fantastic volunteers for the Legal Aid Society, providing crucial service to our clients and valuable assistance to LAS attorneys. With the generous donation of their time, Dan and Roxy help make LAS a better organization, and their dedication is inspiring.